You know, this annoying message when you fire up Internet Explorer? It’s fairly easy to do. Go to Start > Administrative Tools > Server Manager and from the main screen, there is a section called Security Information (screenshot below). You will notice some actions to the right of the security information summary. 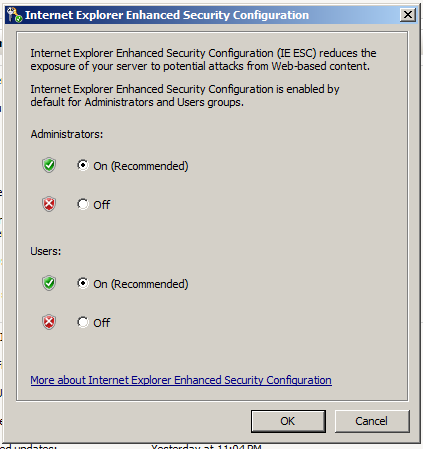 You will see one for Configure IE ESC, click that. And the next screen is straight-forward, you have the option to turn it off for Administrators, Users, or both. Click OK, and you’re good to go!